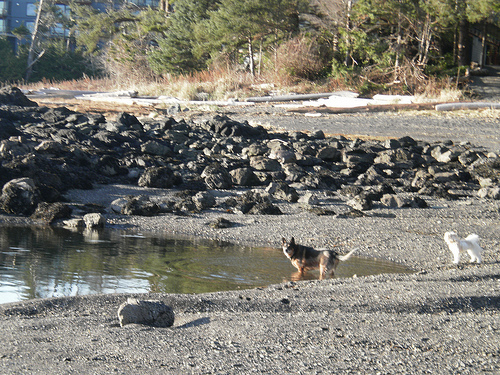 Mocha in the tidepool, Bonus looking on. Sometimes the timing of things is too suspicious, or too perfect to deny. On Sunday, after a whole week of vacation, spiritual learning and beach walks, my big dog Mocha went to heaven. She had a stroke. Just that morning I’d indulged her by giving her a piece of pizza – her favourite. If I’d known it was going to be her last meal, that is exactly what I would have fed her. She was out on a walk in the rain with Sweetie and me. Bonus, the small dog, doesn’t do too well in the rain, and our aging dog appreciated going on walks alone with us, without the bouncing young dog itching to go faster. We tied her outside the grocery store to get some produce, and when we came out, Mocha couldn’t stand up. Her whole body was pulling to the side. I sat with her in the rain while Sweetie went to get the car. I spent the 15 minutes waiting with Mocha getting used to the idea. When I carried Mocha to the car, and later into the house, her body felt light. She usually hated to be picked up – cattle dogs aren’t fans of prolonged body contact. But this time, for the first time, she didn’t strain against me as I carried her. We settled her into her bed, which was lined with multiple towels. I had called the vet’s office, it was closed. I couldn’t get through to the vet on call. The nearest vet office is an hour and a half drive away anyway. Such is life out here on the edge. I knew my dog well. I’ve seen her injured and in pain before, and she was not in pain as she died. She was refusing water. Soon she couldn’t sit up. Her mucous membranes were pale. Her limbs were cooling. I knew what was happening, and I was actually grateful I couldn’t get a hold of the vet. I knew my job was to be present and supportive of Mocha as she died. She had her first stroke at around 2 pm in the afternoon. She would occasionally get mild seizures, and after each one she got weaker. I used everything I’d learned in the past week of spiritual study, everything I’d learned over my life about animal communication and heaven. I explained to her with words aloud and clear images in my head what was happening to her, and I became aware of two Mochas. One Mocha was calm and understood what was happening, the other Mocha was still in her body and aware of the nausea and confusion she was experiencing. It reminded me of when she would come to me, shaking, during thunder storms. I sat with her, on the floor by her bed. Sunshine sat with us the whole time too. She reassured both of us of the naturalness of this event. Sometimes, with exaggerated calmness, she would stretch on her side, or groom herself. She left Mocha’s side only once to go outside for a pee break. As a vet tech, and later as a nurse, I’ve seen a lot of death. Moreso with animals than people. I’ve assisted in the euthanasia of a lot of animals. I know how that goes. But I had never been present before for a natural death, completely unassisted. It reminded me of the home birth movement. Granted, western medicine is wonderful when you need it – it saves lives and curbs suffering. But when you don’t need it, western medicine can be invasive and stressful. I used reiki to help clear the grey static from around Mocha’s head. I could see it clear as day. I became aware that the pain in my neck and shoulders which I’d been carrying all week, had actually been a clot that had formed and sat in Mocha’s neck. The walk up hill had dislodged it and moved it to the brain. The reiki helped to clear the block of energy that was causing her discomfort and nausea. She visibly relaxed when the energy was allowed to drain out of her head, and out of her body, into the ground. I showed her, and told her, over and over that it was time to go. “Good girl. Go! Run!” I opened a portal in our living room, and pulled it’s purple energy down to Mocha. Mocha’s mother, a beautiful red cattle dog came to visit, then ran through the portal and called her with excited barks. I called in all my friends in Heaven. I asked the angels to please take my dog. I explained to Mocha that she could just go now, that her body would finish dying after she left. She was hesitant to go through the purple portal by herself. So I asked Bonus what we could do to help Mocha to leave. This is the same red ball that Mocha had requested the very first time we had a conversation facilitated by another animal communicator, before I’d been able to do it myself. I got the ball, placed it in front of Mocha’s nose (I sensed that she couldn’t really see anymore) and then I showed it to Mocha’s spirit which I could see sitting beside her body. Then I “threw” the red ball into the portal, and it bounced in the grassy field of wildflowers that was visible beyond the purple door. My friend in heaven picked up the ball and began to toss it, and he offered Mocha her favourite treat – roll over from a fanny pack. That did it. Mocha’s favourite thing is fetching that red ball for roll over treats. She went into the portal. At this point, her body began to shudder. I felt Mocha’s attachment to her body was still there, so we talked to her, encouraged her to play with her ball, told her what I good girl she is. Then Mocha’s Mom reappeared with a small jack russel. They took Mocha on the doggy tour of heaven. First they showed her the ocean. They went tearing through it with great abandon. Mocha could drink all the ocean she wanted and would never get sick. She realized with great joy that her body in heaven was strong, that she could race again like she did when she was a puppy, uninhibited by aging hips and organs. Next stop – horse poop mountain. Oh it was the best. It smells delicious, it’s warm and squishy. She could roll in it all day and eat all the fragrant horse poop balls she wanted. Then, the only thing better than horse poop – used tissues, laid out in a line like a trail of bread crumbs. She ate those too, one at a time. This trail led to a barn. Beyond the barn, a herd of sheep. Mocha’s mother said to her, CHASE! And Mocha charged forward after the sheep, who surged forward like a rippling wave across the hillside, their distant “blaaaaaaa” came back to me on a breeze full of agricultural perfume. Our primary focus was on Mocha’s spirit. I’d steal glances at Mocha’s body to see how her death progressed. She was almost limp, her mouth and paws moved, but her soul was far away. Finally, Mocha in the field took a long, significant look at me. It was just like the look she’d give me when I was calling her and she didn’t want to come back. Except this time, I wasn’t calling her back. I was telling her to go. And then, in a decisive movement, she turned tail and walked away. You are the best dog. Thanks. I know you recently lost your kitty. The grief of losing Mocha is such a strange dichotomy. I know where she is, I know she’s fine and happy. She’s been back to visit. But it’s how your routine changes that’s really painful. I keep having these little realizations – I’ll never do this or that with her again. The house is so quiet without our pushy, 60lb dog around. It’s weird, isn’t it, knowing they’re all right where they are but still feeling the physical absence. I still find myself stopping in the pet aisle at the supermarket. I don’t know exactly, somewhere between 10 and 12. She’d been slowing down for quite some time, but I’ve seen how long some dogs her size live. She had been telling me in the past two months that she was getting ready to do, but what do you do with that information eh? It wasn’t a surprise that her time had come, but it happened so quickly. She was fine and healthy on Sunday morning. By Sunday night, I was down a dog. It’s so weird. I am incredibly grateful though that I was spared the agony of having to *decide* when it’s time, and take her to an appointment. It’s the responsible thing to do when they’re suffering, but it’s incredibly difficult. The way this happened with Mocha, there was no pain, and no mental anguish leading up to her last hours. And she did. I’m so grateful for all the ways this went down. But I’m so sad and I just miss my dog.